I’d be interested in finding out where you think the most photogenic place in the UK is – you may like a place for many reasons, like the quality of light, there might be a very distinctive attraction there (like Durdle Door in Dorset) or it could be that you love somewhere which has almost no features – like a common etc (here’s one near us which is particularly lovely, Rodborough Common). Let’s get some ideas, and do add a link to show where you mean if possible! Who needs to go to New Zealand when you can get your Lord of the Rings on just 20 minutes down the road? Also, it sports public toilets and one of THE dogging hotspots in South Wales in its car park! What more could you ask for? Haha! so if the epic scenery isn’t enough for you then you can engage in a spot of… erm… y’know. Wow. Where is this anyhow? A little way between Porthcawl and Port Talbot, bit of a secret place for local folk! Another vote for the Lake District. 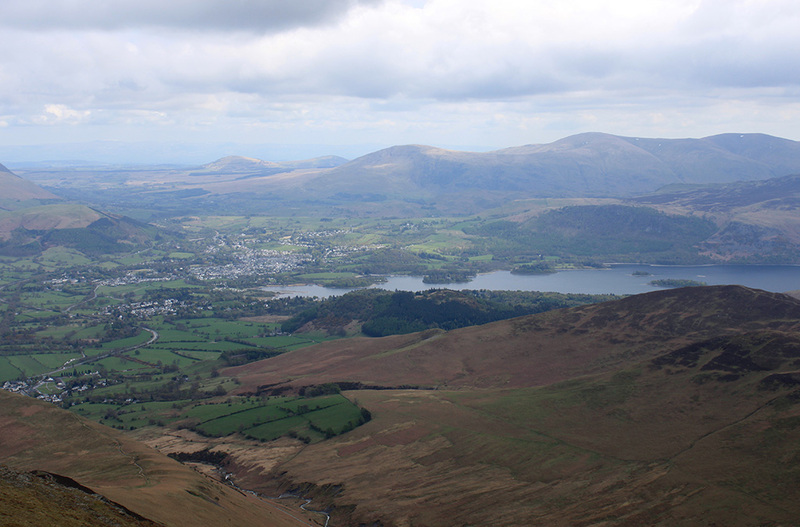 The view down to Derwent Water and Keswick from the peak of Grizedale Pike. I wish I could take photos that would do it justice. I love the sea front at Cramond in Edinburgh. So many different textures in the landscape. On my 40th Birthday I was there early morning and made myself an album of 40 photos. That sounds absolutely great Sara, lovely mental image. I visited Dungeness for the first time last year and was immediately struck by its strangeness and beauty. Just did a Google for it and saw a lovely lighthouse, big fan of lighthouses: great photographic potential. Oh yes! At first I thought that pic of Glasgow Bridge was a huge boat! Just a few thoughts there, and an interesting question with as many answers as there are photographers, I suspect. Oh yes, love this alternative approach to landscape photography – makes for some unexpected photos, there must be all sorts of scrap and ruins out there which are hugely photographable! A couple of summers ago I went to a lighthouse somewhere, from the lighthouse you could see a shipwreck on the seashore in the distance, but I can’t remember where it was! For outdoor photography in London it’s hard to beat Richmond Park. Deer, birds, woodland, rolling hills, walkers, skaters and kite-flyers! Isn’t it intriguing the power that deer have over us – I don’t know anybody who doesn’t melt when they see one, and they look so amazingly graceful and dignified! All of these replies are amazing! Thanks so much for replying and getting this blog off the ground. Keep your responses coming.. and make sure you check out the places and photos others have posted – this is a great opportunity to find new places to explore. You can’t go anywhere in Derbyshire without tripping over beautiful places to photograph! A field just up the road from where I live. A gate near where I live. Loving the field with hay bales… who doesn’t love a hay bale photo! Stunning. They’re all amazing – bravo Oliver! I live in North Wales and up in the Clwyds there are plenty of tracks, waterfalls and other beautiful places for a cheeky photo, especially in about 4 or 5 months as Summer’s coming to a close and the light quality up the hills is awesome. I’ve been to some of those Welsh waterfalls, they’re really something else aren’t they.. I’m pining for them now! Also Barcroft Hall/Field of Dreams when it is in bloom. I really enjoy taking photos at Trowbridge Cemetery – there is a mix of lovely architecture, plants and stonework. Westonbirt Arboretum is one of my favourite places to go, too – it offers so much doesn’t it! Stunning trees, but also great children’s play area etc. I’ve been lucky enough to do photography for them, I went over in the autumn last year to get the colourful leaves/trees – a great day. I’ve changed the link, Sarah – it was too long for the page! Wasdale in the Lake District for me, I think. Gorgeous. Never been, Aidan… but I bet the evening light on the quayside makes for some amazing pics. Stunning photos, thanks for the reply and contributing! I already know the beauty of some of Scotland as I drove alongside Loch Lomond for hours and was awestruck! Edinburgh is also stunning! You’re very lucky.